Each year 15 million infants are born preterm and face high risks of short- and long-term complications, including sepsis, severe inflammation of the gut, and neurodevelopmental disorders. A new report in The American Journal of Pathology demonstrates a link between prenatal inflammation and postnatal immune status and organ function in preterm pigs, suggesting that early intervention (e.g., antibiotics or anti-inflammatory drugs) may be warranted for infants born preterm with signs of inflammation of fetal membranes. “Our study may urge clinicians to be more aware of the population of preterm infants with chorioamnionitis (inflammation of the fetal membrane) as they have higher risks of systemic inflammation and neonatal sepsis,” explained lead investigator Per T. Sangild, DVSc, DMSc, PhD, of the Section of Comparative Pediatrics and Nutrition, Department of Veterinary and Animal Sciences, University of Copenhagen, Frederiksberg, Denmark, and the Department of Pediatrics and Adolescent Medicine, Rigshospitalet, Copenhagen, Denmark. At birth, prenatal LPS induced mild histologic chorioamnionitis and strong fetal lung and gut innate immune responses with elevated inflammatory cytokines and neutrophil/macrophage infiltration. “We believe the epithelial responses were likely derived from direct exposure to intra-amniotic LPS or LPS-induced cytokines,” noted Dr. Sangild. Analyses of chorioamnion, lungs, gut, and plasma samples. (A-C) Images from hematoxylin and eosin staining in the chorioamnion, scale bars represent 100 µm. (D-E, G-H) Myeloperioxidase (MPO) staining in lungs and gut, scale bars represent 200 µm. (F) Lung CXCL8 levels. (I-K) Incidence of severe diarrhea and physical activities in postnatal control and LPS-exposed pigs. (L) Plasma interleukin (IL)-1β levels in the two treatment groups. CON, control pigs; LPS, intra-amniotic lipopolysaccharide exposed pigs. *P < 0.05, **P < 0.01, and ***P < 0.001. Five days later, the gut and lung inflammation subsided; however, the pigs exposed to LPS prenatally gradually developed systemic inflammation, with high levels of blood leukocyte subsets (e.g., neutrophils, lymphocytes) and plasma cytokines (e.g., IL-1β), similar to symptoms found in septic infants. Among those who survived, the pigs in the control group were on their feet and walked for the first time before the LPS-exposed animals. High levels of bacteria were also found in the spleen in the LPS-exposed pigs, indicating increased systemic infection or decreased capacity to clear translocated bacteria. The in utero death rate was higher in the LPS-exposed fetuses compared to the control group, as was the incidence of severe diarrhea. Interestingly, intra-amniotic LPS did not increase the incidence of formula-induced necrotizing enterocolitis (NEC) on Day 5. This is important as it has been suspected that systemic inflammation at birth might also predispose to later NEC in the gut of preterm infants; however, this hypothesis was not supported by this study. “These data suggest that the postnatal systemic effects of short-term prenatal LPS were indirectly initiated from the preceding local inflammation of epithelial tissues in the fetal period, and the effects were gradually amplified systemically during the first few days after preterm birth,” commented Dr. Sangild. 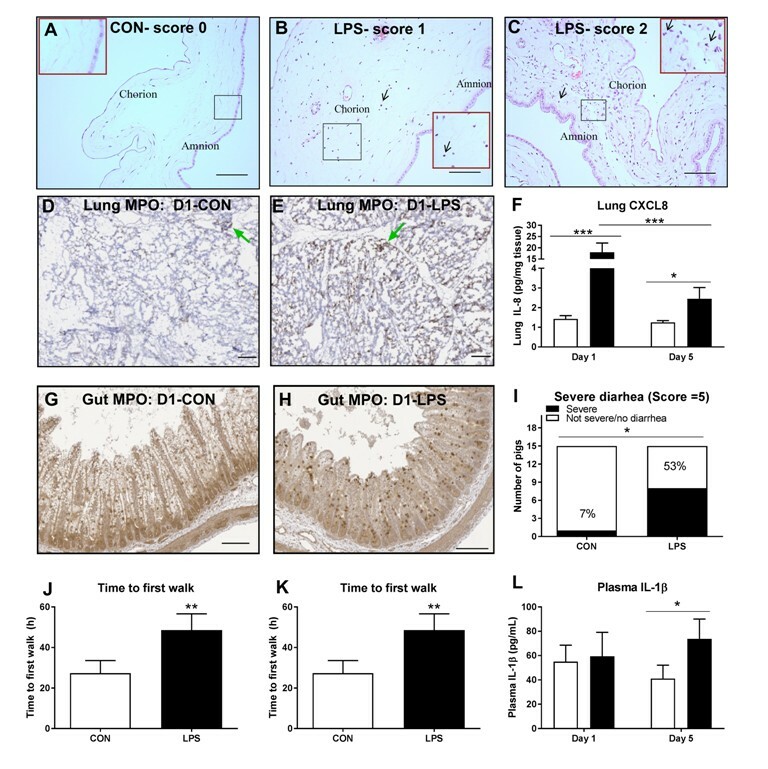 The article is “Prenatal Intra-Amniotic Endotoxin Induces Fetal Gut and Lung Immune Responses and Postnatal Systemic Inflammation in Preterm Pigs,” by Duc Ninh Nguyen, Thomas Thymann, Sandra K. Goericke-Pesch, Shuqiang Ren, Wei Wei, Kerstin Skovgaard, Peter Damborg , Anders Brunse, Charlotte van Gorp, Boris W. Kramer, Tim G. Wolfs, and Per T. Sangild (https://doi.org/10.1016/j.ajpath.2018.07.020). It will appear in The American Journal of Pathology, volume 188, Issue 11 (November 2018) published by Elsevier. This study was funded by the STIMMUNE project granted by the Center of Arla Foods for Health (PTS and DNN) and the NEOCOL project granted by the Innovation Foundation Denmark (PTS). Full text of the study is available to credentialed journalists upon request; contact Eileen Leahy at +1 732 238 3628 or ajpmedia@elsevier.com. Journalists wishing to interview the authors should contact Per T. Sangild at +45 26160530 or xpts@sund.ku.dk.